A “hugely entertaining” (Wall Street Journal) mystery starring “a Royal Tenenbaums-esque clan of geniuses” (Martha Stewart Living)—perfect for fans of Mr. Penumbra’s 24-Hour Bookstore. In this “riveting…brilliant” (Booklist) debut, Hazel Severy, the owner of a struggling Seattle bookstore, receives a letter from her adoptive grandfather—mathematician Isaac Severy—days after he dies in a suspected suicide. In his puzzling letter, Isaac alludes to a secretive organization that is after his final bombshell equation, and he charges Hazel with safely delivering it to a trusted colleague. But first, she must find where the equation is hidden. While in Los Angeles for Isaac’s funeral, Hazel realizes she’s not the only one searching for his life’s work, and that the equation’s implications have potentially disastrous consequences for the extended Severy family, a group of dysfunctional geniuses unmoored by the sudden death of their patriarch. As agents of an enigmatic company shadow Isaac’s favorite son—a theoretical physicist—and a long-lost cousin mysteriously reappears in Los Angeles, the equation slips further from Hazel’s grasp. She must unravel a series of confounding clues hidden inside one of her favorite novels, drawing her ever closer to his mathematical treasure. But when her efforts fall short, she is forced to enlist the help of those with questionable motives. “A novel that is anything but clueless, filled with consideration and compassion” (The Washington Post), The Last Equation of Isaac Severy proves that, like Hazel, you don’t have to love math to fall under the Severy spell. Nova Jacobs holds an MFA from the University of Southern California School of Cinematic Arts and is a recipient of the Nicholl Fellowship from the Academy of Motion Picture Arts and Sciences. She lives in Los Angeles with her husband, Jeremy. The Last Equation of Isaac Severy is her first novel. "Engaging, clever . . . .a sharp puzzle mystery, full of stimulating questions that make it impossible to stop turning the pages. . . . Isaac Severy left me with the lasting realization that mathematics is a love language. Well done, professor." "Clever . . . . Nova Jacobs has penned a novel that is anything but clueless, filled with consideration and compassion." 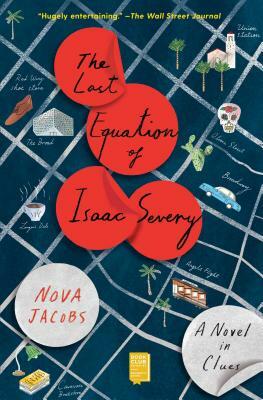 "In The Last Equation of Isaac Severy, Nova Jacobs sends an endearing bookstore owner on a quest for an elusive mathematical formula--but that is only the beginning of her journey. Jacobs weaves a charming, mysterious tale about family bonds, personal ghosts, and the wondrous intersection of mathematics and art. A fun, compelling read." "This book is certainly a treat." "The Severy family would fit right into one of Wes Anderson’s eccentric comedies... Nova Jacobs gives us a portrait of family function and dysfunction that will be familiar even to those of us without fatal genius in our genes." "Jacobs never loses traction — or the fun — of her elaborate storyline . . . . Her complex and carbonated plot is satisfying and refreshing — a debut not to be missed." "A page-turner that will leave you hunting for the clues alongside the main characters."